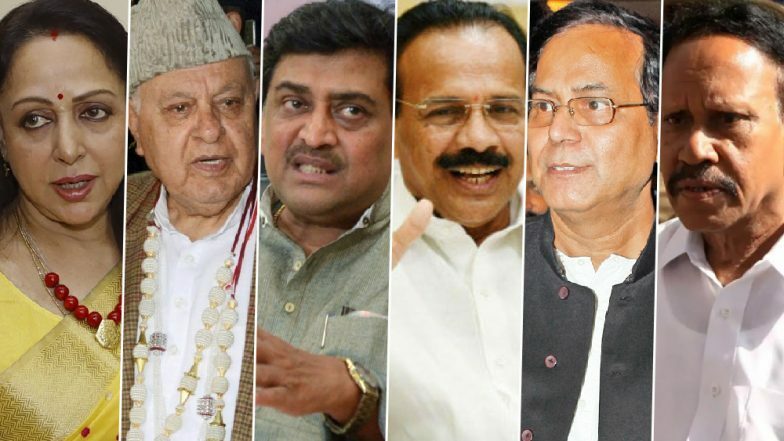 New Delhi, April 16: Major names are in the fray for the second phase of Lok Sabha elections 2019, scheduled to be held on April 18. This round of the polls will feature a contest in 97 constituencies, including the 39 parliamentary segments of Tamil Nadu, 14 of Karnataka, 10 of Maharashtra and 8 of Uttar Pradesh, among others. 2 Lok Sabha constituencies in the conflict-ridden Jammu & Kashmir will also be contested. Check Full Schedule of Lok Sabha Polls 2019. Farooq Abdullah, Srinagar: The former Jammu & Kashmir chief minister and National Conference president will be contesting from his incumbent seat of Srinagar in the polls to be held on Thursday. He is being challenged by PDP's Agha Syed Mohsin and BJP candidate Sheikh Khalid Jehangir. Abdullah had won the seat in the 2017 bypolls, after the then sitting MP Tariq Ahmed Karra had resigned. The contest had recorded the lowest-ever turnout of 7.2 per cent. Hema Malini, Mathura: The actor-politician and sitting BJP MP faces a stringent task in the upcoming polls, as she is being challenged by the RLD-BSP-SP combine. The RLD has fielded Narendra Singh from the constituency. In 2014, Malini had wrested the seat from RLD's Jayant Chaudhary. However, her victory was abated by a fragmented opposition and a sweeping wave in favour of Narendra Modi. Ashok Chavan, Nanded: The Maharashtra Congress president was one of the handful of party leaders in the state who emerged victorious in 2014, when the BJP-Shiv Sena combine routed most of the incumbents. The sitting Nanded MP is being challenged by Chikhalikar Pratap Govindrao of the BJP and Abdul Samad of the Samajwadi Party. Chavan, reports claimed, was in favour of giving the ticket to his wife and as he is likely to enter the polling fray in October-November as the chief ministerial candidate in the assembly polls. However, the party high command decided to field the former CM considering that it would boost the cadre morale. DV Sadananda Gowda, Bangalore North: The senior BJP leader had succeeded in retaining one of the most high-profile constituencies of southern India in the last parliamentary polls. Gowda, who served a Union Minister throughout the tenure of the outgoing government, is being primarily challenged by Congress' Krishna Byre Gowda in this round of the polls. M Thambidurai, Karur: The Deputy Speaker of 16th Lok Sabha is one of the topmost AIADMK leaders in the polling fray. With the AIADMK regime facing anti-incumbency, Thambidurai is facing one of the most stringent challenge this time. The Opposition alliance has fielded Congress candidate S Jothimani. The Karur Lok Sabha seat, being represented by Thambidurai since 2009, is considered to be a textile hub in Tamil Nadu. The constituency suffers from lack of industrial development, increasing pollution and water scarcity. Mohammed Salim, Raiganj: The CPM veteran was one of the two Left Front candidates elected from West Bengal in the 2014 general elections. The Raiganj seat, a Congress bastion, was wrested by him with a narrow margin of less than 1,850 votes. In Raiganj, the main rival candidates are Deepa Dasmunshi of the Congress and Kanhaiyalal Agarwal of the TMC. Farmers' distress is expected to be one of the dominating issues in this round of the polls. The 8 UP constituencies are dominated by sugarcane voters, who have protested on several occasions in the last 5 years over the delay in remunerative payments. Similarly, the 10 Maharashtra seats being contested tomorrow are located in the Marathwada region, facing one of the worst agrarian crisis. In Karnataka, where, 14 seats will be contested, a section of the state's farmers have marked their dissent against both the Centre and the state government over the alleged inadequate MSPs. The farmers of Tamil Nadu -- where all the 39 seats are on line in the second round -- have staged several agitations in the national capital against the lack of adequate remunerative prices. 111 farmers of the state have also filed their candidature against Prime Minister Narendra Modi from Varanasi to highlight their plight.